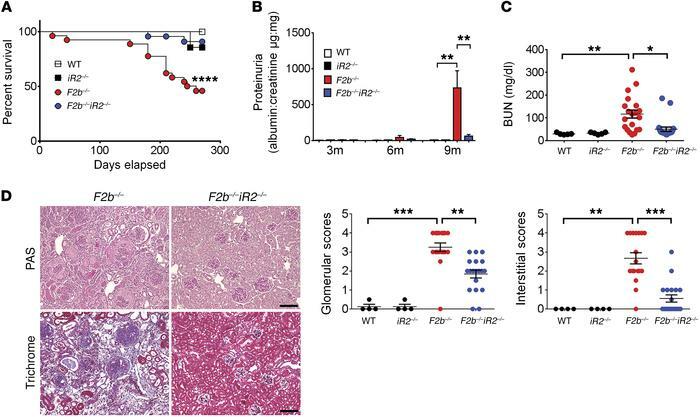 iRhom2 deficiency protected Fcgr2b–/– mice from severe kidney injury. Female Fcgr2b–/– (F2b–/–) mice crossed with Rhbdf2–/– (iR2–/–) mice were assessed for survival and kidney injury. Survival (A), proteinuria (B), and BUN (C) were measured. For survival and proteinuria, n = 15 WT, n = 7 Rhbdf2–/–, n = 27 Fcgr2b–/–, and n = 24 Fcgr2b–/–Rhbf2–/– mice. For BUN, n = 5 WT, n = 5 Rhbdf2–/–, n = 20 Fcgr2b–/–, and n = 21 Fcgr2b–/–Rhbdf2–/– mice. For survival, the log-rank (Mantel-Cox) test was used. (D) Histological analysis of kidneys by PAS and Masson trichrome staining. Scale bars: 50 μm. Pathological scores for glomerular and tubular-interstitial areas. n = 4 WT, n = 4 Rhbdf2–/–, n = 20 Fcgr2b–/–, and n = 21 Fcgr2b–/–Rhbdf2–/– mice. (B–D) Data are shown as mean ± SEM. *P < 0.05; **P < 0.01; ***P < 0.001; ****P < 0.0001, 1-way ANOVA with Dunnett’s multiple comparisons test.